• Simon’s MS in Business Analytics program provides training in Python, R, and Tableau to help you leverage the big-data insights that companies need. • Accelerate your program completion with our 10-month study track, or gain real-world experience with an expanded 17-month internship option. • Simon’s MSBA program is STEM-designated, which shows recruiters that you’ll arrive on the job with analytic tools and leadership skills that positively impact a company’s bottom line. In addition, the designation allows international students to stay in the US for up to 36 months on a student visa, if hired in a STEM-eligible role. • Get hands-on learning experience by participating in the Simon Pricing Club, which undertakes a number of regularly scheduled initiatives in conjunction with the Center for Pricing, including attending the Professional Pricing Society conference and inviting pricing industry leaders to campus. Learn more about our MS in Business Analytics program details. There are currently 95 students in the MS in Business Analytics program that are, on average, 23-years old. About 65 percent of the class is comprised of female students, with 35 percent male students. The GMAT range (80th percentile) is between 640–730, and the GPA range (80th percentile) is between 3.0–3.8. Students in the program have an average of one year of previous work experience. 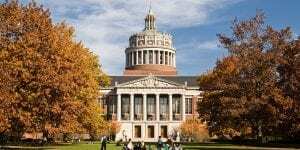 Tuition for the University of Rochester MS in Business Analytics is currently $66,000. More than 60 percent of Business Analytics students receive scholarship support. Simon Business School is honored to waive the application fee for active-duty military members and veterans and other eligible full-time MBA applicants. • Required of all international candidates except those who attended three or more consecutive years of post-secondary education taught solely in English and received a baccalaureate or master’s degree from a college or university where English was the language of instruction. • Strongly recommended by the Simon Admissions Committee for international applicants to demonstrate English proficiency.